Dr. Glenn Selk, Oklahoma State University Emeritus Extension Animal Scientist, offers herd health advice as part of the weekly series known as the "Cow Calf Corner" published electronically by Dr. Peel and Dr. Glenn Selk. Today, Dr. Selk offers tips on how to go about developing a cavling protocol for your cow/calf operation. "In these studies, heifers that were in stage II of labor much more than one hour or cows that were in stage II much more than 30 minutes definitely needed assistance. Research information also shows that calves from prolonged deliveries are weaker and more disease prone, even if born alive. In addition, cows or heifers with prolonged deliveries return to heat later and are less likely to be bred for the next calf crop. Consequently a good rule of thumb: 'If the heifer is not making significant progress 1 hour after the water bag or feet appear, examine the heifer to see if you can provide assistance. 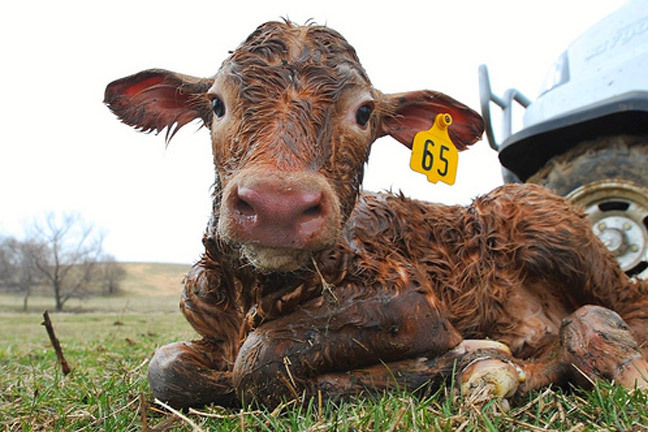 Mature cows should be watched for only 30 minutes before a birth canal examine is conducted.' Make certain the cervix is completely dilated before pulling on the chains. If you cannot safely deliver the calf yourself at this time, call your local large animal veterinarian immediately. "Most ranches develop heifers fully, and use calving ease bulls to prevent calving difficulties. However, a few difficult births are going to occur each calving season. Using the concept of evening feeding to get more heifers calving in daylight, and giving assistance early will save a few more calves, and result in healthier more productive two-year cows to rebreed next year."